Angus, of Dawg Day Cards, recently sent me a padded mailer full of Cubs baseball cards, out of the goodness of his heart. Apparently, he found an interesting oddball set of Cubs in a Arizona card shop while on vacation during the past couple of weeks. Angus picked up, purchased, and mailed said set out to me, just because he thought I might enjoy it - ain't he a swell guy? Please, feel free to give me your tired, your poor, your huddled masses of Cubs cards yearning to breathe free. I shall give them shelter. The cards arrived at my doorstep over the holiday weekend and, seeing as I was busy cooking out, blowing stuff up, and eating and drinking way too much, it's taken me a couple of days to show off Angus' generosity. Sorry! The set in question turned out to be a stadium giveaway from August 28th, 1992. On that date, while beating the Giants 3-2, the gave out 20,000 sets of Nostalgia baseball cards - these cards featured great players of the franchise's past and included no current or active players (thus, no Sandberg, Maddux, etc.). These SGA's were sponsored by longtime Cubs partner, Old Style, who emblazoned their logo on the backside in order to preserve the antique-like aura of the cards, with their sepia color scheme, serif text, no-frills design, and old-timey photographs. The only trouble is that I did already have this set - I bought a complete edition from my LCS about a decade ago, when I first started my CATRC in earnest. 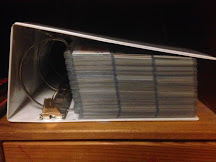 After all, these retrospective sets proved to be quite helpful to getting that binder off of the ground and the Old Style Nostalgia set was soon broken up and scattered amongst the collection. That's no matter though - it's the thought that counts and I was more than happy to flip through the full set for the first time in many years. 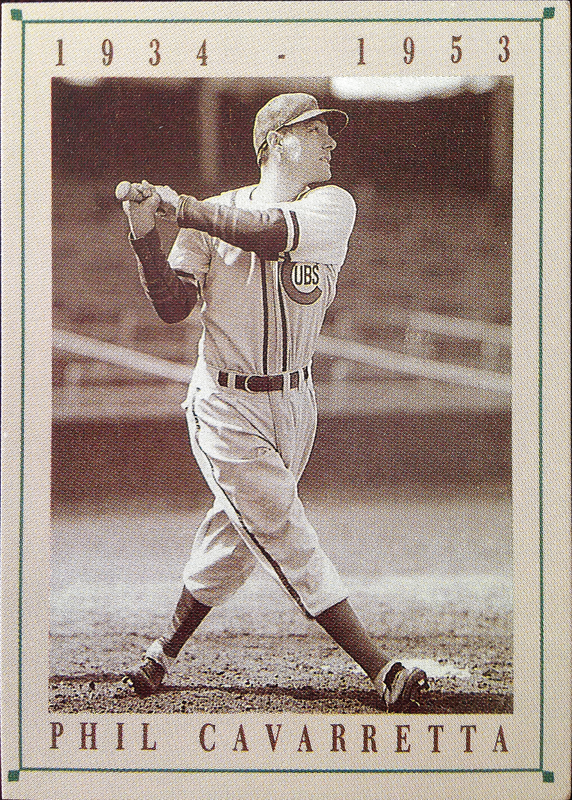 The player selection spanned the entire history of the Cubs franchise, starting from the beginning with Adrian "Cap" Anson - the first member of the 3,000 hit club. Continuing on with the Deadball Era, it features many familiar faces, including the poetic Tinker to Evers to Chance combo and "Three-Finger Brown." One of my favorite characteristics of these oddballs is the inclusion of the player's tenure with the club, just above the photograph. 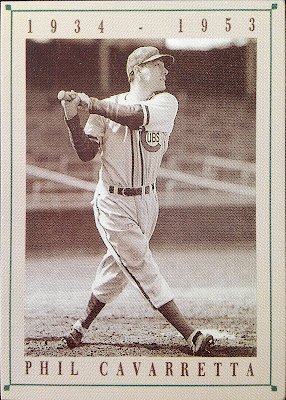 This is where I first learned that Mordecai's Cubs career was actually split between two stints, playing for the Cincinatti Reds and three Federal League teams in the meantime. From there, included were a bunch of big name stars from the 30's, 40's, and 50's, as represented by "Hammerin' Hack," "The Mayor of Wrigley Field," "Rajah," and "Gabby." Interestingly enough, I could be wrong, but it appears to me as though the creative minds behind this SGA set might have accidentally used an image of Hack Wilson during his extremely brief time with the Phillies - 7 games in 1934. So, any Phanatic collectors out there, this may be something low-key to pursue. We start to move into then-recent history from there, with a sampling of favorites from the "almost there" Cubs teams of the late 60's/early 70's that just couldn't quite get over the hump. An Ernie Banks card or a Ron Santo card are always welcome sights, but the pictures selected for the Fergie and the Billy Williams cards definitely steal the show here. Ferguson has either gone searching for lost balls in the Wrigley ivy or is taking part in some sort of publicity shot. Meanwhile, I'm not certain, but I believe that this "hat tip" (paging Dime Box Nick) shot of Williams hails from "Billy Williams Day," June 29, 1969, when the Cubs honored their iron man leftfielder for playing in his 896th consecutive game and passing Stan Musial as the National League record holder. What a cool moment to capture on cardboard! Then, we end up right on the doorstep of the 1990's with a pair of Cubs hurlers who had only fairly recently left town; in fact, Rick Reuschel had only just retired a year before. "Big Daddy" doesn't get enough credit for as good as he was, the product of being the ace on some pretty bad Cubs teams of the 1970's. Also, I find it interesting that it took Bruce Sutter and his split finger mastery a while to garner enough attention to get into the Hall Of Fame when the Cubs were recognizing his greatness just a few years after unceremoniously cutting ties with the closer. They knew. Of course, the best part about a team produced, team-centric, nostalgic set, with such a deep checklist is that, while you get all of the familiar faces, you also see a lot of names that don't normally show up in a mass-produced product. Oddly enough, just yesterday, Dime Box Nick and I were discussing Grover C. Alexander and his lack of Cubs cards on the market via Twitter. GCA spent the majority of his years in the Bigs with the Cubs (9 in CHI, 8 in PHI), yet he rarely pops up in a Cubs uniform. For that matter, it seems like the 373 game winner and STL World Series hero doesn't show up on modern retrospective cards very often at all. Maybe it's because his career was split nearly evenly in two major markets? Ken Hubbs may very well have been up there with the Banks, Santos, and Williams of the era, if it weren't for his tragic death in 1963. If the 1962 NL ROY hadn't died in a plane crash, Hubbs and his impeccable glove was on stardom trajectory and his cardboard imprint could have easily matched those aforementioned names... what might have been. The backside of these cards features one of my favorite characteristics of any baseball card set ever produced. Yea, you have the brief, tiny typeset vitals and career highlights - nothing groundbreaking when it comes to card backs. Then, that extra white space leftover from the microscopic text is sopped up by the Old Style logo, because sponsorship. However, what steals the show here is obviously the graphical representation of the team's home jersey from the era in which the depicted player starred on the diamond, along with the corresponding logo. Not only do you get to see the history of the team's players, with this set, you also get to witness the evolution of the franchise's threads and combination mark. This is far and above the normal effort presented on team issued baseball cards. It looks as though these drawings hail from the National Baseball Hall of Fame's "Dressed to the Nines" database, which is now widely available online; however, obviously, this information was not as easily accessible in 1992. I'm sure that the card collectors and baseball history buffs taking in Wrigley Field that summer day were thrilled by this inclusion. 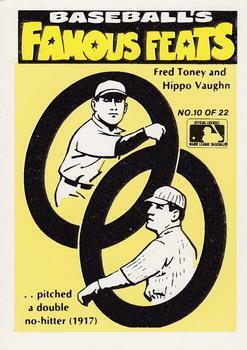 A 1986 Fleer Laughlin team sticker, the back of which payed tribute to the famed double no-hit duel pitched by Vaughn and the Reds' Fred Toney. Had I had that Old Style Nostalgia SGA, it would have easily knocked the Laughlin card out of my CATRC, as I give preference to cards which do not force my Cubs to share the spotlight. Now, Angus' gift has taken it's rightful place in my CATRC binder as Hippo's representation and I'm learning from Socrates - that's not exactly what I expected this blog post to conclude with, but here were are. Thank you, Angus, for thinking of little ol' me and forwarding these cards my way. Even if it didn't turn out that my already possessed copy was incomplete, getting a new copy that I could flip through again and keep intact would have been a-ok with me. As it stands, the only thing I know is that I know nothing... about my collection! Angus is an awesome dude. I'm overseas at the moment but he reached out to me and let me know that I have a package waiting as well for when I return! Also I wouldn't feel too badly about taking a couple of days to post this, I was so busy with work and preparing for my trip that I have about 5 similar packages from awesome and generous folks waiting in front of Angus'. Sports card collectors really are a killer bunch, and Angus is among the best! I'm glad you enjoyed the set, and sorry to hear your previous one was incomplete. (I hate it when that happens!) And I'm glad that it gave you an upgrade in your CATRC. I liked finding out that the set was a stadium giveaway. I had no idea where it was from. Hopefully you will be able to use the doubles as traders. Can't believe I've never heard of this set before! So many great names -- Hubbs, Hack, Hornsby -- and so many great shots -- Billy, Fergie, Ernie. If you ever decide to part with any of the cards Angus sent...you have my address! Though I TOTALLY understand wanting a second, intact set to peruse, I've been tempted to buy two copies of certain sets in the past -- one for the binders, one for the sake of having them all in one place. Glad to see Angus back in the mix. One of my favorite trade partners. That set is amazing!